← Halogen equivalent MR16 Tracklight LEDs have arrived! Here’s an interesting article I found while surfing the web this morning. Batteries as we know them might be changing soon to power our ever more hungry personal devices…. Microchip-sized generators that burn fuel to convert heat into electricity could power smartphones, tablets, laptops and other mobile devices for much longer than batteries can, researchers say. As power-hungry mobile devices proliferate, researchers are striving to develop clean, portable, compact sources of energy for them. Batteries are the most common way to power electronics, but the chemistry employed for them is limited in terms of how much energy they can yield per pound. In contrast, many hydrocarbon fuels — including fossil fuels and their more renewable counterparts — can provide nearly 60 times more energy per pound, leading scientists to investigate ways to harness them for mobile devices. One strategy for getting electricity from fuels involves thermophotovoltaics. Just as conventional photovoltaics convert light to electricity, thermophotovoltaics do so using the infrared rays emitted as warmth from combustion engines or any other heat source. However, until now, there were no thermophotovoltaics that worked at small scales. Now scientists have developed a thermophotovoltaic generator the size of a microchip, just one square centimeter in area. “It is really a small power plant in a button-sized device,” Celanovic says. The hope is to convert chemical energy into electricity “with no moving parts, no noise, no vibrations, on a millimeter-scale, using a fundamentally simple yet robust energy conversion scheme to achieve remarkable energy densities — being able to run your devices for weeks on a single fuel cartridge,” Celanovic says. 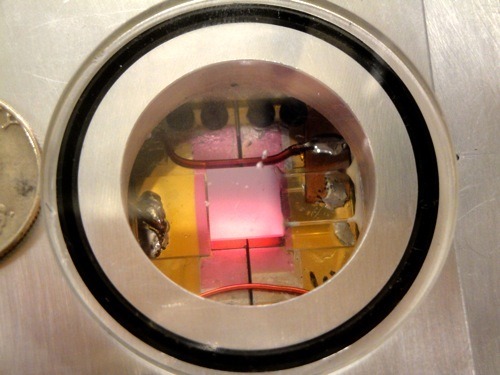 At the heart of the experimental prototype is a micro-combustion reactor, a flat slab only 100 square millimeters in size that is made of silicon. It burns propane and pure oxygen. In principle, “the fuels that can be used range from butane and propane all the way to liquid fuels including biofuels and JP8, a ubiquitous military logistics fuel,” Celanovic says. Sandwiching the reactor are thermophotovoltaic cells made of gallium, indium, arsenic and antimony, four panels that convert infrared radiation into electricity. Another component then converts the raw electric output into useful levels of current and voltage. A potential weakness of thermophotovoltaic generators is how any given thermophotovoltaic material only converts a limited band of wavelengths of light into electricity, with the rest of the thermal energy being lost. To overcome this challenge, the researchers placed Buck Rogers-sounding photonic crystals between the reactor and the thermophotovoltaics. Just as electronics controls the flow of electrons, photonic crystals manipulate light. The photonic crystals in the device, which are made of silicon and silicon dioxide, act like color filters on top of stage lights — they only let infrared wavelengths the thermophotovoltaics can absorb leak out while keeping the rest in. The result is to let as little energy bleed off as waste heat as possible. “Immediate applications for this research are portable power sources for consumer electronics, dismounted soldiers and small robots, flying and regular,” Celanovic says. In addition, this research could one day enable ultra-high-energy-density power sources for deep space probes. The simplified proof-of-concept device had a predicted heat-to-electricity conversion efficiency of 2.7 percent, and the scientists experimentally reached 2.5 percent efficiency. After several years of large-scale efforts, researcher Peter Bermel, an electrical engineer at Purdue University, suggests microthermophotovoltaic generators could reach up to 32 percent conversion efficiency, meaning they could deliver more than five times the energy per pound that batteries can. 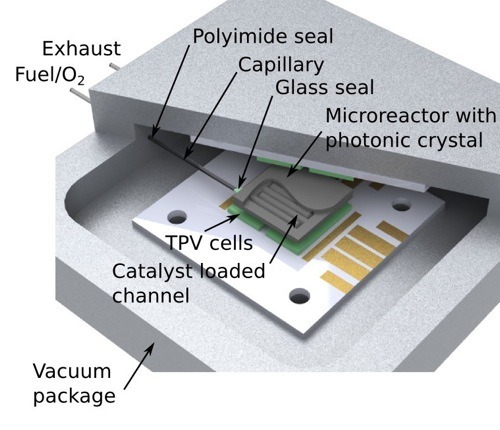 This would require high-efficiency micro-combustion reactors, more advanced photonic crystal fabrication and higher-performance thermophotovoltaic cells. They also would want combustion reactors that burn using air instead of pure oxygen. “This is work in progress, and our system demonstration, although very advanced and ground-breaking, is by no means a finished product ready to be fielded,” Celanovic cautions. The scientists detailed their findings online Feb. 25 in the Proceedings of the National Academy of Sciences. Top Image: Photo of the experimental thermophotovoltaic generator in operation. Courtesy Walker R. Chan. Planning for Climate Change: Test your backup generator! The Dawn of GOP and Trump. Here’s a new renewable energy storage option. Zina Akard on Google. Doing the right thing. valet parking on Google. Doing the right thing.